They also paint the onetime first lady and New York senator as technologically maladroit – she was all thumbs with an office fax machine – and distant enough from her husband Bill that their aides kept each informed about the other’s doings. She used her email to let aides know she was thirsy. ‘Pls call Sarah and ask her if she can get me some iced tea,’ one message read. The email also showed an expansive role for Sidney Blumenthal, who was banned from working at the State Department by the Obama administration. Instead Blumenthal was a paid employee at the Clinton Foundation, along with having financial interests in Libya, and sent questionable intelligence to Clinton. Clinton has claimed that the reports from Blumenthal were unsolicited, but this is contradicted in email previously discovered. Some Clinton supporters have rejoiced in the lack of a smoking gun but no smoking gun was ever expected. The issue has nothing to do with finding a smoking gun. The issue was that Clinton violated rules in existence when she was Secretary of State, she lied about what she did at her news conference per media fact checkers and FOIA officials, she improperly destroyed email, and the email ultimately turned over to the State Department did not include email involving Libya and terrorism (and therefore was not all personal email as she claimed). Regardless of what potentially incriminating email might have originally been present, it is unlikely that anything incriminating is still present after Clinton improperly deleted thousands of email and edited others. The email which Clinton turned over to the State Department after leaving office, and after deleting thousands of email messages, is now being released monthly under a court order following the previous failure of Clinton to respond to FOIA requests. CNN adds that Obama aides knew of the private address. This is also not anything we didn’t know before. The issue never was solely that she had a private email address. The violation of rules was in exclusively using a private server and failing to turn over the email using the personal email address for archiving while in office as required by law. Plus knowing she had a personal email address is not the same as knowing she was using a private server. Email on a normal personal email address is still legally accessible. Email stored on her private server is not. When Hillary Clinton was made Secretary of State there was tremendous concern, from members of both parties, about the conflicts of interest this entails due to the Clinton’s financial interests. Two rules were established to attempt to prevent conflicts of interest. The first applied to all cabinet officials after the email scandals of the Bush years (which Clinton included in her attacks on the Bush administration for shredding the Constitution). To increase transparency, rules were established by the Obama administration in 2009 for all email to be archived on government servers. Clinton violated this, and used the private server to keep information both from Congress and the media. The top Freedom of Information Act official at the Justice Department has stated that Clinton was in violation of the rules and the State Department’s top Freedom of Information Act officer has called her use of a private server unacceptable. An ambassador under Clinton was even fired with failure to abide by rules related to not using private email being cited as a reason by the Inspector General (pdf of report here). Buzzfeed has obtained email showing that the top lawyer for the National Archives also expressed concern over Clinton’s use of a private server. After Clinton’s press conference about the email scandal, news media fact checkers showed ares in which she was lying, especially with her claim of not breaking the rules. 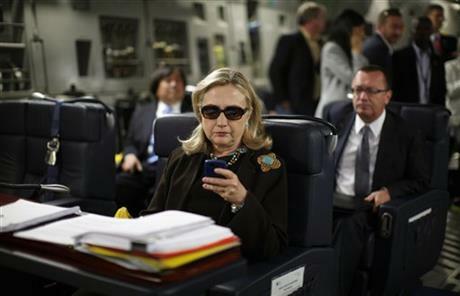 AP subsequently also found that her claim about not wanting to use two devices out of convenience did not hold up as she was actually using two devices for email when Secretary of State. It has more recently been found that Clinton’s claim of only destroying personal email appears to be false. « Elizabeth Warren Loves Bernie–Will She Campaign For Him?